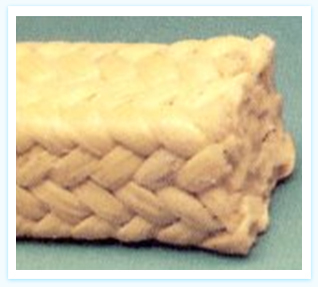 Aramid Kevlar Corner Packing has a high degree of resiliency and consistency of volume and hence avoids frequent gland adjustments. Aramid (Kevlar) Low thermal expansion characteristics under actual operating conditions reduce mechanical pressure against shaft sleeves to minimise abrasion effect. This packing is recommended for solvents, mild acids and alkalis, fuel oil, digester pumps, food, pharmaceuticals, petro-chemicals, pulp and paper industries. A good packing for high pressure dozing pump and high pressure water injection system. The rings made out of this packing are recommended to use as 'BACK -UP' rings (anti-extrusion rings) with other types of soft packings especially where high pressure is involved.